LOS ANGELES, CA--(Marketwired - Apr 22, 2014) - Award-winning actress and filmmaker Elizabeth Yoder, who won "Best Actor" and the Ribaut Award for "Best Short Film" at the 8th Annual Beaufort International Film Festival, has been nominated for "Best Actress" at this week's Jersey Shore Shorts Festival. Her captivating portrayal of Grace in the original short drama, The Long Wait, was written and directed by multi-award winner Wolfgang Bodison. Other Jersey Shore Shorts Festival nominations include "Best Short Film" and "Best Director" for Wolfgang's dramatization, inspired by the tragic childhood events that took the life of Elizabeth's father. Screenings have sparked high emotions, garnering Audience Choice nominations for "Best Actress", "Best Short Film" and the Jury Choice Award for "Best Director" at the 18th Annual Playhouse West Film Festival in September 2013. "This journey in filmmaking has been extremely gratifying. I am so grateful to see our labor of love getting this recognition," said Elizabeth, an alumni of LA's famed Playhouse West School and Repertory Theatre since 2004. Notable graduates include James Franco, Jeff Goldblum, Ashley Judd and others. In addition to Elizabeth's prolific work on stage and screen, she is the Founder of Elevating Hope, a charity that helps the bereaved transition through grief and suffering to find acceptance, forgiveness and healing when someone close dies. 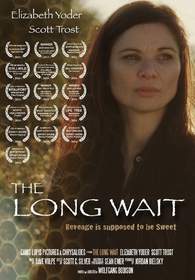 Upcoming screenings of The Long Wait are scheduled at the Myrtle Beach International Film Festival at 2:30 p.m. on April 25th at Carmike Cinema; the West Chester Film Festival at 9:30 p.m. on April 25th at Knights of Columbus and 2:15 p.m. on April 26th at Boxcar Brewpub in West Chester, PA. Screening and nominations for "Best Short," "Best Director" and "Best Actress" at the Jersey Shore Short Fest at 1:45 p.m. on April 27th in Asbury Park, NJ at The Showroom; the Hill Country Film Festival in Fredericksburg, TX, at 10:00 a.m. on May 3rd; and the Idyllwild International Festival of Cinema starts at 6:30 p.m. on Saturday, May 31st, at the Historic Hemet Theatre. For more info on The Long Wait or to interview Elizabeth Yoder, contact Eileen Koch at EKC, a full-service Branding, Marketing and PR firm at 310.441.1000 or email Eileen@eileenkoch.com. Visit www.EKCPR.com. "The Long Wait", starring Elizabeth Yoder, written and directed by Wolfgang Bodison. Story by Elizabeth Yoder and Wolfgang Bodison.